As I have said before one of the many reasons I love attending beauty / fashion events is because we usually v kindly receive goodie bags containing a number of products including various beauty products from different brands which we may not be aware or got round to trying before we received them in our goodie bags. One brand I discovered this way was the Skinician skin care brand and as I attended a lot of events in 2017 I was v lucky that I received a 50ml Purifying Toner and 30mls of both the Advanced Time Delay Day Cream and Restoring Night Cream from their range in different goodie bags which was a great way to try a number of their products together over a period of time . In Ireland in 2012, mother & daughter team, and owners of the already successful 4Beauty Group, Hilary McMurray and Shelley Martin stepped into the ultra-competitive world of skincare with the launch of SKINICIAN – a professional skincare brand focused delivering results. In the 15 years previous Hilary stepped out of a successful corporate career in insurance and into entrepreneurship with the purchase of her own beauty salon in County Down, Ireland. Later Hilary created the now internationally recognised He-Shi professional self-tan which developed Hilary’s resolve to do something exceptionally exciting in skincare. This time, with the support of Hilary the development of SKINICIAN was spearheaded by her daughter Shelley. Shelley worked with a range of skincare salons and professional therapists on the needs of salons and what was really important to them. Over a period of 3 years a small army of engaged skincare professionals diligently briefed, formulated and tested thousands of products. In the search for perfection, that process of formulate and test re-started, then re-started again until the SKINICIAN products we see in salons all over Ireland delivered on promise and were finally approved. You can find out more about the Skinician range via the link here. I love the sleek but practical packaging – always prefer when brands emboss their logo, details onto the packaging instead of using stickers, though does not affect the actual products, dislike the way some brand’s stickers start to ‘move’ with usage. 1. Purifying Toner (100ml – £19.60) – suitable for Normal/Combination Oily Skin Acne Skin. Use twice daily after cleansing both morning and night to face and neck area; – I personally am not a ‘toner’ fan as although I have tried a number of toners from different brands over the years and understand what the benefits should be, I have yet to find one that has made any great difference to my normal / combination skin after using, my favourite toner type product to date would be the Liz Earle Instant Boost Skin Tonic. 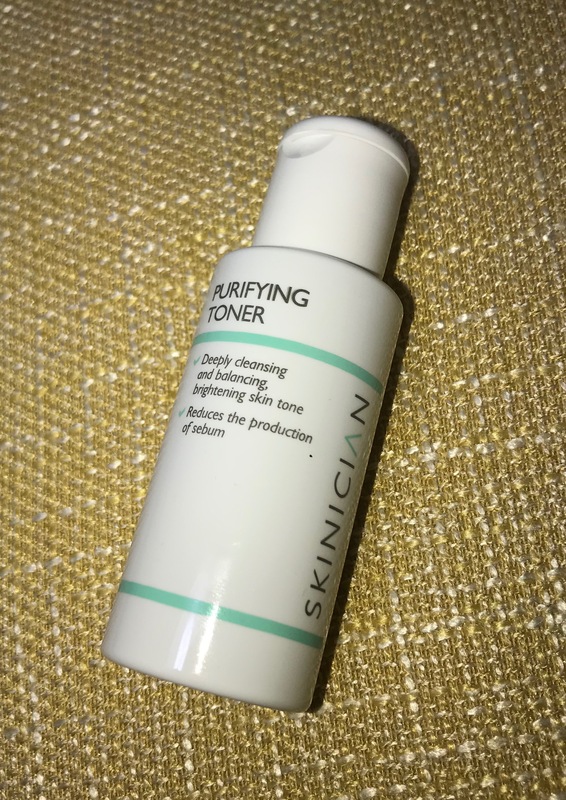 The Skinician purifying toner although not too overpowering still has that ‘toner’ type smell which I do not really like, the Liz Earle one doesn’t. Very easy to apply with cotton pads (full size will be even easier as it has a spray applicator, good for applying during the day as well) – I used as directed twice a day and although it did seem to help reduce the shine on my t-zone area slightly over a period of time, I have not noticed any other benefits so still not convinced but saying that think this toner may be better for an even oilier skin. Therefore as I still not a ‘toner’ fan will not be rushing out to purchase but if you enjoy using toners and have really oily / skin prone to breakouts I think this may be a good one for you to try. 2. Advanced Time Delay Day Cream SPF 15 (50ml – £39.50) – suitable for Ageing Skin / Dry Skin /Dehydrated Skin /Sensitive Skin Normal/Combination Oily Skin. Apply after cleansing and toning, warm a small amount gently in the palm of your hand and apply generously to the face and neck area (avoiding eye area), leave skin to absorb moisturiser for five minutes before applying makeup – So happy to see this cream, and the night cream, come in squeezeable tubes (full sizes are in similar packaging). This white cream has a v light spa like fragrance and when applied as directed it sinks into skin so easily with no greasy residue, initially skin may feel a little sticky but within a few minutes this disappears and skin then feels smooth and looks refreshed with a slight glow, skin also feels hydrated. I have had no extra breakouts and found this is a perfect base for my IT Cosmetics foundation but if using a heavier foundation I would still suggest mixing a little serum or a slight bit of moisturiser into your foundation before applying especially if you have any really dry areas. I love this cream can be used on the neck area as well and although I usually try most facial moisturisers on this areas as well this is the first moisturiser I have started to notice a difference after using, my skin on my neck area also feels smoother and looks more hydrated as well. I am really impressed with this moisturiser, exceeded my expectations – I do think it is suitable for all skin tones, ages especially mid twenties up – my daughter received this moisturiser as well and she loves it as well, she has normal to dry skin. I will be purchasingv soon as it has now become my favourite day time moisturiser. Definitely recommend trying it for yourself. 3. Restoring Night Cream (50ml – £39.50) – suitable for Ageing Skin /Dry Skin /Dehydrated Skin /Sensitive Skin /Normal/Combination Oily Skin. Botanical B-Gucans increases skin softness by up to 21%, suppleness by up to 26%, and improves moisturisation by up to 23%. Use daily at night to face and neck – allow to fully absorb and nourish the skin for at least 8 hours. As before this cream also comes in a tube. It is an off-white cream and again with just a v light spa type fragrance. I applied / apply at night as directed after cleansing although initially feels v slightly tacky on the skin it quickly absorbs into the skin. After application my skin looks more refreshed and in the morning my skin did / does appear fresher, fines lines are not as obvious after prolonged use and again skin feels hydrated, smoother and looks revitalised as well, again when applied to the neck area it also helps to keep it hydrated and smooth. I feel when I use both the day and night creams together with my Antipodes serum underneath this is currently my best combination so will definitely will be purchasing this night cream as well. I also feel that if I continue to use both I do not really need an additional neck cream as these both do such a good job. Again recommend trying if you can. I am so impressed with these products, although will not be purchasing the toner this is only because I am really not a toner fan, think it may be able better for a more oily skin. 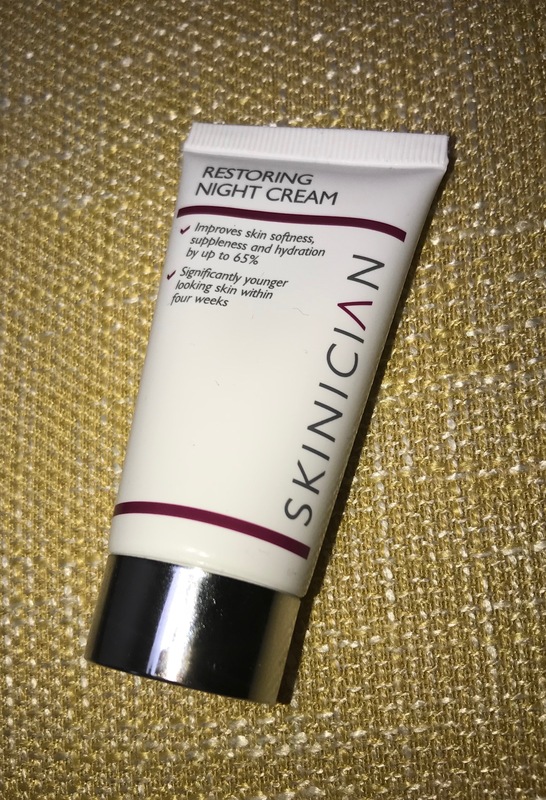 However I love the day and night cream delighted with results and although at £39.50 it may seem expensive compared to some other brands, it is still more reasonable than others and as they are 50ml sizes and you need so little product they will last for ages. I definitely think they are well worth the money and an added bonus is they are an Irish brand which is fantastic. 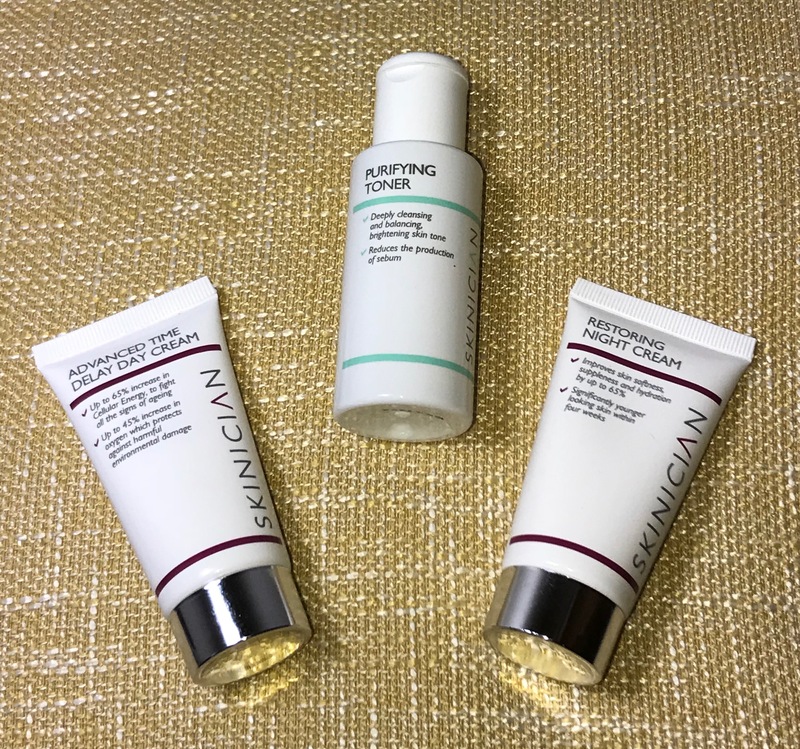 I have already checked out the rest of the Skinician range and now also want to try the Pro-Radiance Enzyme Cleanser, peel and advanced eye repair as they sound good as well – they are now on my list of products to purchase soon, after I get using similar products I already have. Currently Skinician have the following great offer online, when you purchase either the Advanced Time Delay Day Cream or Hydrating Day Moisturiser you get a FREE facial exfoliator, come together in a pack, which is fantastic as wanted to try the exfoliator anyway. You can check out, see more from the Skinician range via the link here. Look forward to any comments you may have. Have you tried any products from this range before? If you are not already a follower would love you to follow my blog too – would mean a lot. Will have more posts up tomorrow and / or during the week.